After a quarter of a century together, the iconic Boyzone recently announced it’s time to say goodnight as they prepare for their farewell tour of the UK. Australian fans will also get a chance to say goodbye to them in March & April this year when the Irish superstars hit our shores. Boyzone were one of the most endearing groups to emerge from the "boy band" music sphere and 90’s commercial pop. They also happen to be one of the most successful bands in Ireland and the UK. The group have sold 25 million albums worldwide, played stadiums & arenas all over the world, went onto release six albums and had almost two-dozen hits (including six No. 1 singles & five No. 1 albums). Boyzone have seen great success in Australia over the years as well where their hit singles became staples at pop radio in the 90’s—songs such as Picture Of You, No Matter What, Love Me For A Reason and Father & Son. In conjunction with the tour, Boyzone have just released their final album Thank You & Goodnight last Friday though Warner Music Australia. The album finds them collaborating with some very special guest songwriters in the shape of Ed Sheeran (Because) and Gary Barlow (Love). Producers on the album include Xenomania’s Toby Scott, John Shanks (Take That, Westlife), young Swedish hitmakers Goldfingers and Steve Soloman (James Arthur, Jason Mraz). The album features 12 brand new tracks and the band are excited to share a very special tribute to Stephen Gately in the shape of a new song I Can Dream. Boyzone came across a demo that Stephen originally recorded for his solo album in 2002 and they’ve had the opportunity to re-work the song and add their harmonies alongside his lead vocal. The group said "It was a bittersweet experience to hear all our voices together again. It’s the closest the five of us will ever get to being in a room together again making music." Supporting Boyzone will be fellow singer-songwriter, Brian McFadden, who began his singing career as a member of Westlife in 1998. He left the group in 2004 to pursue his solo career which saw him release his debut album Irish Son with the first single reaching No.1 in the UK. In 2005, his third single Almost Here became another No.1 UK hit and went platinum. Brian moved to Australia in 2008 where he released his second album Set in Stone. In 2010, Brian then released a single Just Say So featuring American rapper Kevin Rudolf and it went straight in at No.1 in the Australian charts and spent 10 weeks in the Top 10. During his time in Australia, Brian became a judge on "Australia’s Got Talent" for three series. Brian is currently working on brand-new solo concept and he is recording and producing a new album collection of soul classics. 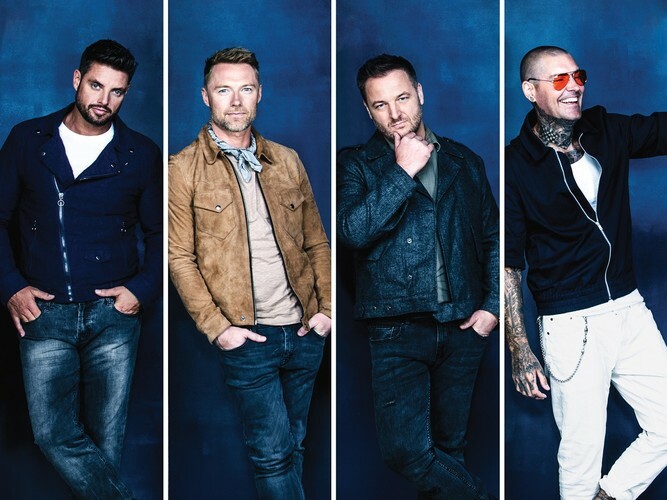 Don’t miss out on the opportunity to farewell Boyzone—it’s going to be one very special night where you will hear all their hits and more!